This product is a wireless mouse M545. Customizable controls and a new, more powerful scroll wheel give you effortless, natural navigation in Windows 8. 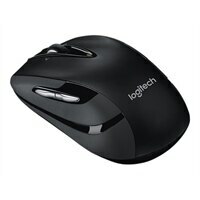 Logitech M545 Optical 7 Buttons Wireless Mouse - 2.4 GHz USB Wireless ReceiverThis product is a wireless mouse M545. Customizable controls and a new, more powerful scroll wheel give you effortless, natural navigation in Windows 8. It flashes green when mouse is powered on, and it flashes red when the battery power is low. The function of this button depends on your operating system and the application being used. For example, if you are browsing the Internet in Windows and click on a link using the Middle button, typically the link opens in a new tab. When the mouse is not in use, you can store the Pico receiver inside the mouse.